The Washington County Fair in West Bend, Wisconsin is not your ordinary county fair. The fair dates back to the mid-1800’s so it enjoys a rich tradition and a special place in the community. 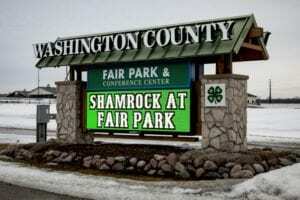 Nowadays it’s not unheard of for Washington County Fair Park to host over 100,000 attendees. That means the park’s new signage can’t be ordinary, it has to make a great first impression! 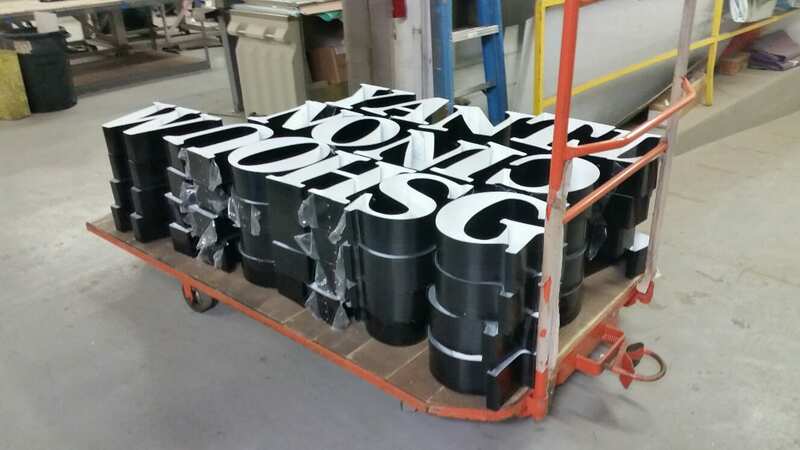 Sign Effectz, Inc. had been servicing the park’s existing sign for nearly 10 years. Built in 2002, the sign is several generations old. It was the best technology available at the time. Sixteen years is a good lifespan for any electronic sign. However, as time went by, sign replacement parts were becoming harder to get and eventually obsolete. For example, in late 2016, the LED boards were no longer available, making service more difficult. Getting updated signs into the County budget took a few years but everyone involved knew the day would come when the signs would not work at all. The new sign package includes signs in 3 locations on the park’s campus – one major highway sign plus matching signs at two entries to the park. We refaced all the existing identification signs. We also re-lamped them with Keystone brand LED lighting. 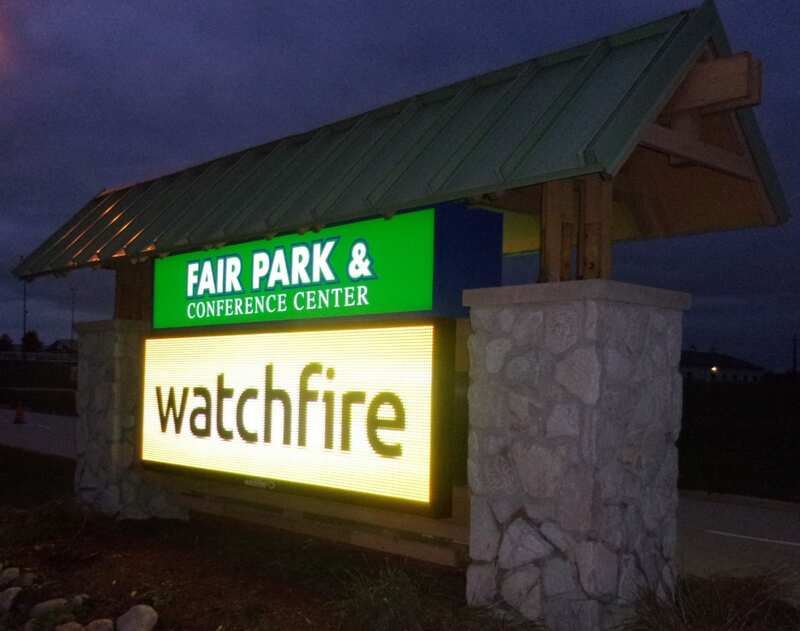 16mm full color Watchfire EMC display (previous display was a 35mm 4’ x 17’); size: 7’ x 17’ W. The resolution/pixel count in the new display is 2 ½ times that of the old display. Implementing 281 trillion colors vs basic monochrome red. CHANNEL LETTERS: New 24” tall raceway mounted channel letters reading Washington County mounted on the roof structure to highlight the County owned property. 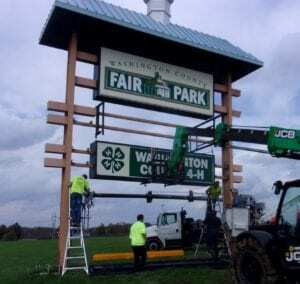 EXISTING SIGNS: We refaced all the existing signs with new Flex faces increasing the size of Fair Park lettering, dramatically improving readability, and freshening the current 4H sign. One each at the South Fairgrounds Entrance and the East Fairgrounds Entrance. Utilizing the existing structure we removed all the current signs. 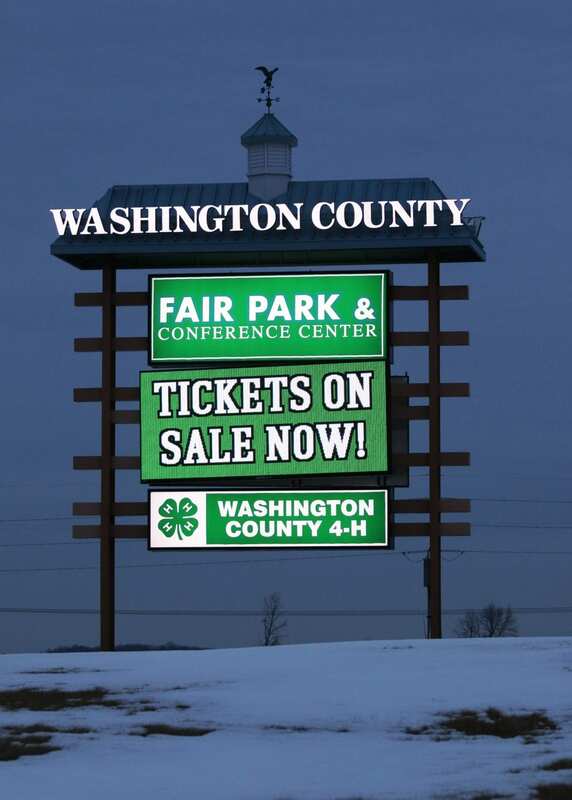 We added (4) sets of 14.5” channel letters on the roof structure reading Washington County. We installed (4) new 2’ x 10’ SignComp extruded aluminum sign cabinets with polycarbonate face and LED lighting reading Fair Park Conference Center. And we replaced the 12” x 10’ monochrome EMC with (4) new Watchfire 16mm full color 3’ x 10’ displays. All the changes/updates to the sign can now be done remotely from any PC or device with an internet connection”. No fiber or CAT 5 cables are needed. Watchfire’s software and code implementation provides a secure connection to the display preventing any hacking. Chad Defenbaugh, Watchfire, Wisconsin Territory manager, commented “All the Credit to Sign Effectz, they did a great job determining the proper size and resolution to propose to the fairgrounds. We appreciate partnering with them on this project. With digital signage we take three critical variables into consideration: the speed of traffic, the setback of the display from the moving audience and the install height the LED sign. Most important, is what the end user is trying to accomplish with the display. Will it be very dynamic content with pictures and motion or primarily test messages? Images really grab peoples attention and text is what relays the intended message. 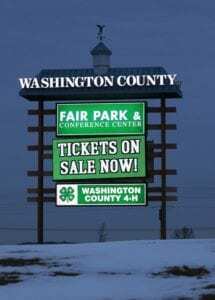 Washington fairgrounds really wanted the best of both worlds”. The sign installation crew met and handled several challenges, mainly the weather. Keeping to the installation date was high priority and was met head on with 4 days of rain and mud. Our install team worked through it and completed the install on time (one week) and on budget. Modifications of the existing sign structure included 4”x4”X 22’ steel tube cut to length on the job site. All the fabricated steel supports for the EMC display were covered with galvanized paint matching the existing framework. We removed any of the existing signage that was obsolete. Our team also removed existing lamps and retrofitted them with Keystone white LED self-contained bulbs. A full plywood road served as a bridge over grass and mud for our crew members, equipment and trucks. Once in the right spot for the installation, the trucks remained in place until the job was done. We’ve heard positive comments from city officials as well friends and relatives about how readable the sign is from the highway. Don commented, “I can easily see what’s happening at the fair grounds now. In the past, it was difficult to tell what was happening there. You might see a full parking lot but who knew what was taking place that day.” The park’s staff members have learned the software and are utilizing it to its fullest advantage.